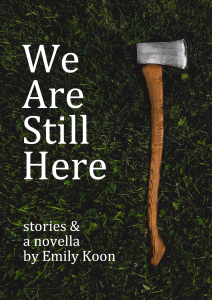 In early 2017, we announced Emily Koon’s We Are Still Here as the winner of our Book & Chapbook Contest, judged by Matt Bell. Two years later, a couple revisions, a half-dozen cover mock-ups, and we’re finally ready to bring this beast of a book to market. It’s slated for release this July. We’ll have printed galleys on display at this year’s AWP Conference in Portland. If you’re a reviewer interested in receiving an advance copy, reach out to editors@coniumreview.com. We Are Still Here contains thirteen short stories and a novella. Throughout this stellar debut, discover a surreal band of mall dwellers, a fairy tale featuring goblins and ghosts, a “go wherever” story in which Lizzie Borden is fully prepared to give her mother forty whacks, and more. Pre-order your copy of Emily Koon’s debut collection here.